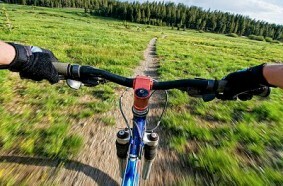 Lake Tahoe biking trails offer breathtaking scenery and an adrenaline rush like you have never experienced before! Beginners can enjoy easy cross country trail rides, while advanced riders get a thrill out of technical downhill runs. The Flume Trail mountain bike trail is outstanding with easy to moderate terrain and incredible views. The ride up to Watson Lake is fairly secluded and offers a great workout. If you are looking for bike rentals and services, check out Northstar Mountain Bike Park Center, which is also a great resource for excellent North Lake Tahoe bike trails. Quench your thirst for adventure by exploring some of the many Lake Tahoe biking trails!